Tesla has had quite a good run lately. Their stock has nearly tripled in the past six months; the Model S has been showered with accolades including Motor Trends 2013 Car of The Year, Automobile Magazines 2013 Automobile of The Year and Consumer Reports recently awarded it the highest score of any car they have ever tested. Think about that for a minute. Consumer Reports has been testing cars for over seventy five years, they now test about 80 cars per year and the Model S achieved a score of 99 out of 100 which is the highest any car they have tested has ever scored. Ladies and gentlemen, the electric car has arrived. 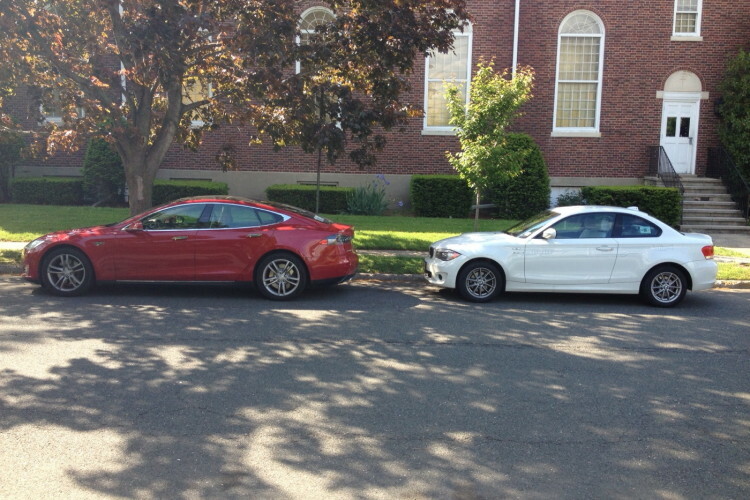 I’ve had the chance to take a Model S on a short drive before, but last week I had a brand new 85kWh Model S for the afternoon, courtesy of friends Phil & Nancy Blackwood. The Blackwoods were in BMW’s MINI-E program as I was but elected not to lease an ActiveE as I did; citing the need for more range than the 94 mile EPA rated ActiveE would deliver. Like me, a few months after they got their MINI-E back in 2009, the Blackwoods installed a solar array on the roof of their house. As was the case for me, it only took a few months of driving electric to convince the Blackwoods that they would be driving electric from then on. Once you experience that revelation, the decision to go solar is an easy one. Having the ability to make your cars fuel by capturing sunshine is just too good to pass up and many other electric vehicle owners have done exactly what the Blackwoods and I have. 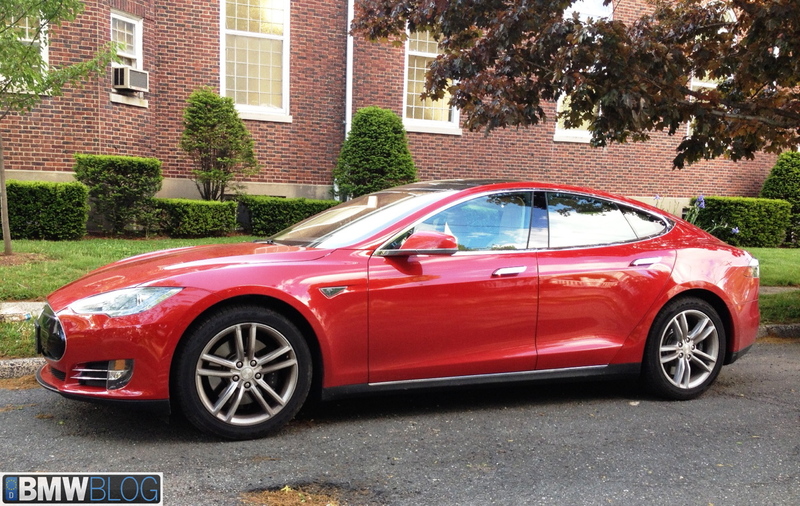 So wanting to drive electric but needing more than 100 miles of range the choice was clear; they would buy a Tesla Model S. The Model S is available in two battery sizes. The 60kWh battery is EPA rated at 208 miles of range and the 85kWh battery is rated at 265 miles. The 60kWh version starts at $71,070 and the 85kWh costs $81,070. There is also a performance version which costs $96,070. They all qualify for a $7,500 federal tax credit which is not included in the above pricing. Some states also have additional incentives for zero emission cars. 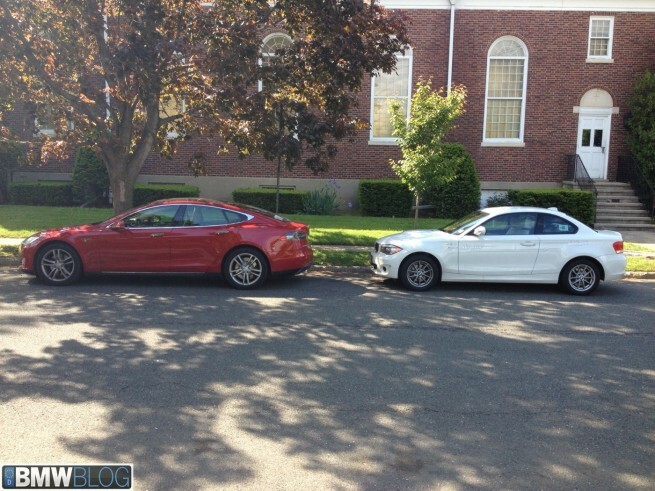 For example I live in NJ and electric cars are tax exempt so that would account for an additional $5,000 to $7,000 of savings over a comparably priced gasoline car. The car I drove was an 85kWh, (non performance version) and with options cost about $86,000 before the $7,500 federal tax credit. When Motor Trend tested the 85kWh performance version it achieved a 0-60 time of 3.9 seconds. The non-performance version such as the one that I drove has a 0-60 time of 5.4 seconds. I’ve driven cars as fast as this, but the experience of driving an electric car this fast is really surreal. Having 325lb-ft of instant torque at your disposal at any speed, combined with the ultra quiet and vibration-less cabin is hypnotizing. All you want to do is punch the accelerator at every opportunity. It handles like a sports car, partly because of the low center of gravity. The battery pack which is the heaviest component of the car is located beneath the passenger compartment, and employs the same modern body-on-frame architecture that the BMW i3 will use. I believe this is the best way to properly engineer an electric car and I am very happy BMW agrees. Internal combustion vehicles can never have such a large percentage of the vehicle’s weight at or even slightly below the axle line and this is a great advantage for improved handling. 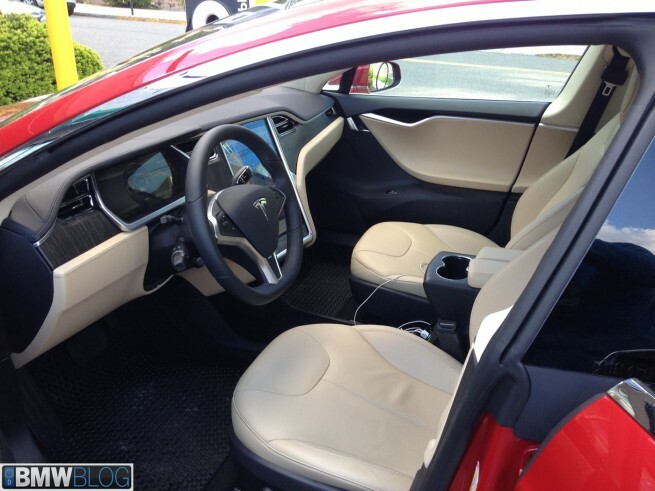 Once inside the Model S it’s apparent the cabin is very spacious for a car of its size. Cargo space is also plentiful and in addition to the rear hatch area there is a large front trunk or as Tesla calls it, a “frunk”. This is also due to the dedicated electric vehicle architecture. Since the entire drivetrain is below the passenger compartment, there is more interior and cargo space available. Again, the i3 will share this advantage and BMW has said the interior volume of the i3 will be nearly as much as in a 3-Series, even though the car is much smaller. However the i3 will not have a 17” touchscreen display that is basically the entire center console and controls just about everything in the car like the Model S has. It’s huge, very clear, full of features and intuitive to use. 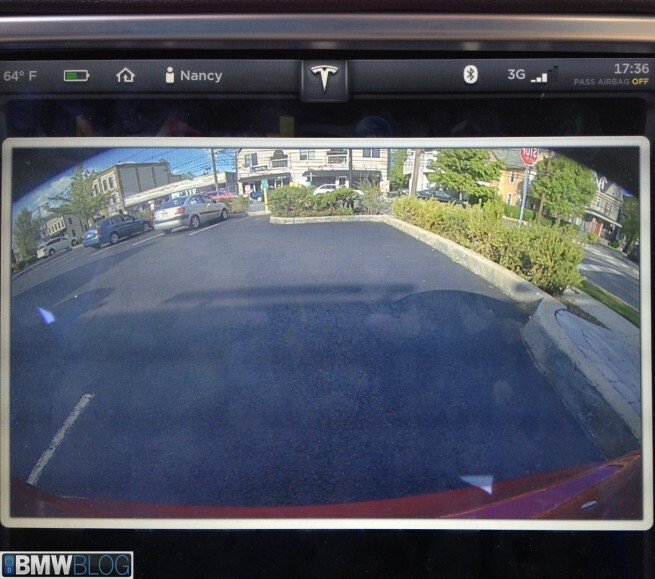 You can open and close the sunroof by sliding a bar back and forth, browse the internet, get directions, view your energy consumption data and much more. The rearview camera display uses half of the screen and is necessary in my opinion as looking back from the drivers seat doesn’t offer the best rear view. You also have access to any song you want to hear, all you need to do is use the voice command and call out the song you want. The car finds it over the internet and plays it. I used all day and only once did I have trouble getting the song I wanted to play. Charging times at home can vary depending on whether or not you buy the optional 20kW onboard charger. The car comes standard with a 10kW charger which would take about 9 hours to fully charge a totally depleted battery. The optional 20kW charger costs $2,700 and cuts the charging time in half. It’s important to note that these charging times are for a fully depleted battery which is good for 200 to 300 miles depending on driving conditions. However let’s say you drove 60 miles one day and then plugged in. With the 20kW home charger you would be back to 100% charged in about an hour, without it two hours. The 85kWh Model S also comes standard with Tesla’s Supercharging feature allowing owners to charge the car at Supercharger locations for free. Telsa allows their customers to use their Supercharger network at no cost and has promised that they will always be free. Therefore if you happen to live near a Supercharger you can basically charge your car there all the time and never pay a penny for your fuel for as long as you own the car. Superchargers can charge the car more than 50% in about a half hour. Tesla is installing their Superchargers along major corridors across the US. It’s a proprietary network and other electric vehicles will not be able to use it. Tesla wasn’t satisfied with the industry standard J1772 connector that all other electric vehicles use so they designed their own connector. It’s sleek, much smaller than the J1772 connector and can charge from all sources of electricity from 120V to the 480V Supercharger supply. I like Tesla’s connector much more than the J1772. It’s sleek and lighter and easier to plug in. Telsa also provides Model S owners an adaptor so they can charge the Model S from any standard public charger that uses the J1772. 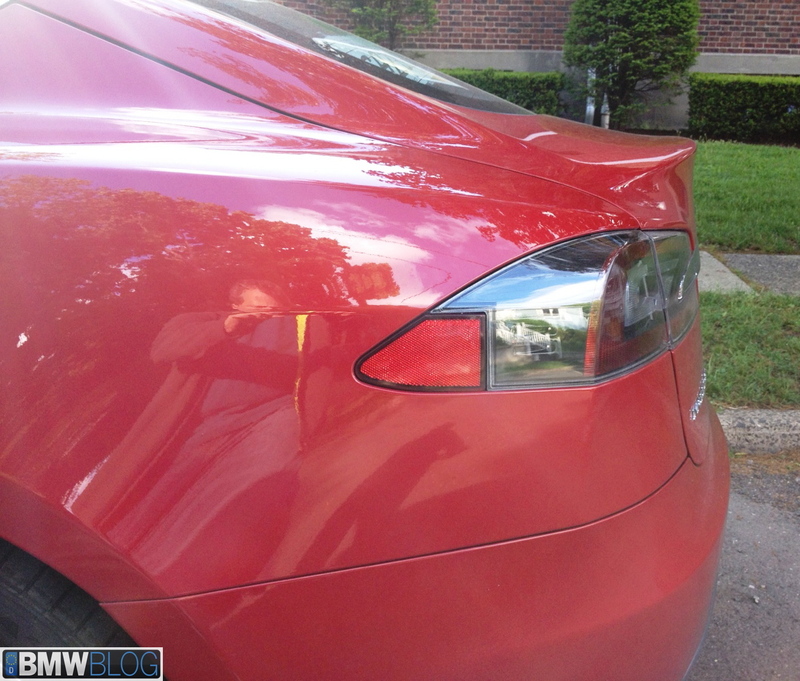 Even the charge port has a unique location and is hidden beautifully behind the driver’s side taillight, eliminating the need for a dedicated fuel filler door. It doesn’t take long to realize Tesla really took nothing for granted and really started with a clean sheet of paper when designing the Model S. Aerodynamics is very important for efficiency with EV’s and Tesla managed to achieve a .24 drag coefficient for the Model S giving it the lowest Cd of any production car today. The first thing you notice when you walk up to the car are the door handles. They retract into the door to reduce aerodynamic drag but as you walk up to the car with the key they automatically slide out to allow you access. After getting inside you realize there is no “ON” button. To turn the car on you simply step on the brake and the car silently comes to life. Brilliant. 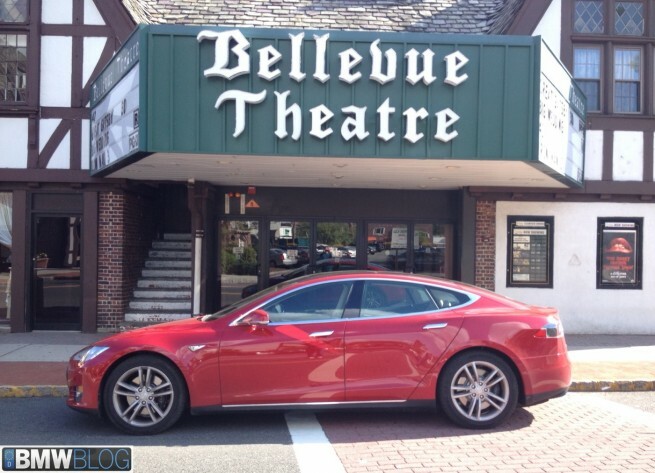 Tesla eliminated everything you usually need to do before you step on the brake and put the car in gear. You don’t need to unlock the door to get in, or put the key in the ignition or even turn it on. You just walk up to the car with the key in your pocket and the door handle automatically extends out to you. You then get in, simply step on the brake, put it in gear and you’re off. 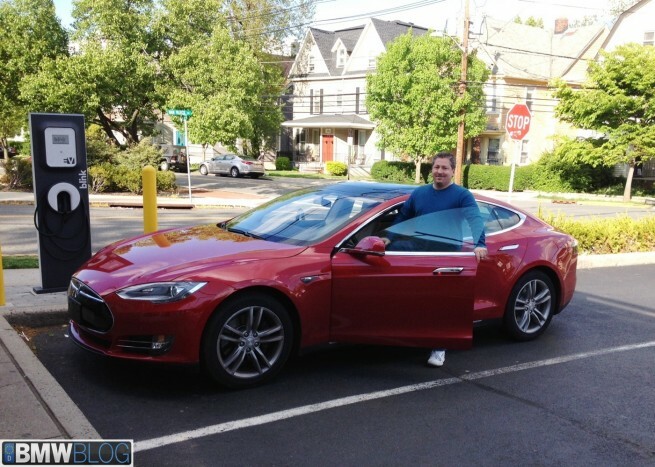 I’ve driven just about every modern electric vehicle and nothing really compares to the combination of luxury and performance of the Model S. My ActiveE is a great car, and I would say the fit and finish of the ActiveE is much better than that of the Model S, but the performance of the Model S is just astonishing. I know many BMWBLOG readers are true performance enthusiasts, and some probably wouldn’t even consider getting an electric car. Do yourself a favor and go to a Tesla store and arrange a test drive, even if you can’t afford one or have no intention of ever buying one. It’s just an experience every car enthusiast should have. The neck-snapping torque will put a grin on any petrol head’s face, I promise you. I can only hope the cars in BMW’s i brand captures the same exhilarating driving experience the Model S provides. Being a premium performance brand, and based on their track record I have no reason to believe otherwise and look forward to driving the i3 and i8 later this year. It seems others agree the Model S has the goods also because since it’s launch the Model S is selling very well. In fact for the first quarter of 2013 it has outsold all other luxury cars in its class. (Link to CNN story). I was thinking of the best way to summarize the Model S driving experience and then I read what Consumer Reports Jake Fisher wrote about it and realized he nailed it: “It accelerates, handles and brakes like a sports car, it has the ride and quietness of a luxury car and is far more energy efficient than the best hybrid cars.” That pretty much says it all.